Emergency responders rushed to guard a nearby stream from fluids that leaked from a truck after it crashed on Marsac Avenue. A Summit County health official says makeshift dams were quickly built out of soil and rocks to stop the flow. A truck crashed into a residence in Old Town on Wednesday evening, landing on its side, causing structural damage to the building and leaking fluids that required a hazardous-materials response. 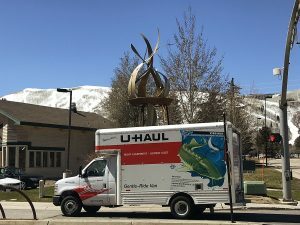 The truck was traveling downhill on Marsac Avenue close to the Marsac Building when the brakes failed at approximately 5:30 p.m., a Park City Police Department officer who responded said. The Police Department said in an online statement the driver suffered injuries that were minor and did not require him to be taken to a hospital. Officer Mikel Archibeque, who responded to the accident scene, said nobody else was inside the truck. There were no injuries inside the house, 316 Marsac Ave. 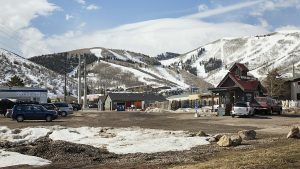 The Park City Fire District said two people were inside. They were asked to vacate the premises and were allowed back inside later in the night, Bob Zanetti, the assistant chief of the Fire District, said. Archibeque said the truck, which was carrying construction supplies, lost the brakes just before the accident. The Police Department said in the online statement the driver “veered the truck into the hillside” after the brakes failed. The online statement said the truck also hit a parked vehicle. Nobody was inside the parked vehicle, the statement said. The Police Department, the Fire District and other government officials responded, shutting down a stretch of Marsac Avenue close to the crash scene. The closure lasted approximately five hours. A Fire District hazardous-materials team and the Summit County Health Department were dispatched to the scene as well. Caution tape surrounded the truck and emergency responders were briskly moving from one part of the scene to another as they assessed the situation and secured the site. There was visible damage to the house, with wood strewn about steps from where the truck came to rest. The truck’s cab stopped partially underneath a deck. The hood was knocked open in the accident. Firefighters and other responders also worked to guard the nearby stream system from the fluids that leaked from the vehicle. They shoveled dirt and positioned a long, snake-like measure that appeared to be a protective boom close to the water. 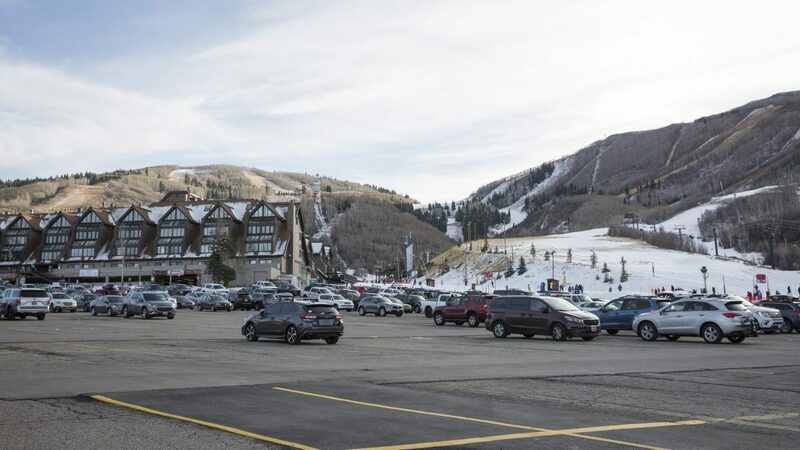 Phil Bondurant, the Summit County environmental health director, said an estimated 150 gallons of diesel fuel, approximately 20 quarts of motor oil and upward of 25 quarts of antifreeze leaked. 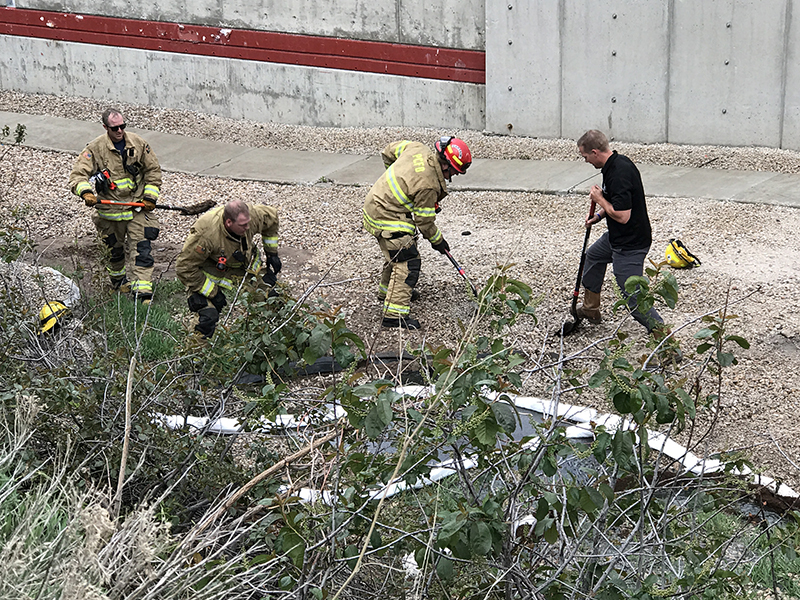 The fluids traveled downhill on Marsac Avenue, into a storm drain approximately 300 feet away from the scene of the crash before collecting in a culvert on the south side of the Marsac Building, he said. Bondurant said firefighters and Health Department staffers quickly built makeshift dams out of soil and rocks to stop the flow. They used specially designed absorbent pads and other material to collect the fluids. None of the fluids entered a waterway, he said. The Fire District arrived at the scene almost immediately after the accident, Zanetti said. Firefighters commandeered woodchips and compost from a nearby yard to divert the diesel fuel away from a storm drain, he said. “They made do with what they could find there,” Zanetti said. He said a City Hall official determined the building was unsafe for occupancy as a result of the damage it sustained. 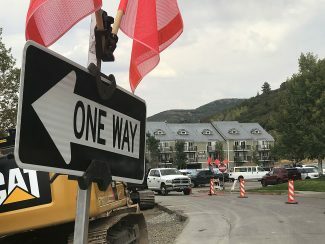 The Park City Building Department said the building suffered damage to the foundation and a front deck. The Fire District shored up the building using wooden beams that a heavy rescue engine carries at all times. There has been a series of bad accidents on Marsac Avenue over the decades blamed on failing brakes on the steep street, which descends from the upper reaches of Deer Valley to the Old Town roundabout. A truck-escape lane was eventually built on the road, which is part of the state highway system. The accident on Wednesday, though, occurred downhill from the truck escape lane.